Last month a young Norma Hernandez was introduced to readers in “Life Outside the Comfort Zone”. That article traces the roots of her Chicano activism, advocacy for children and the establishment of Barrio Station as a response to youth issues in the Barrio. 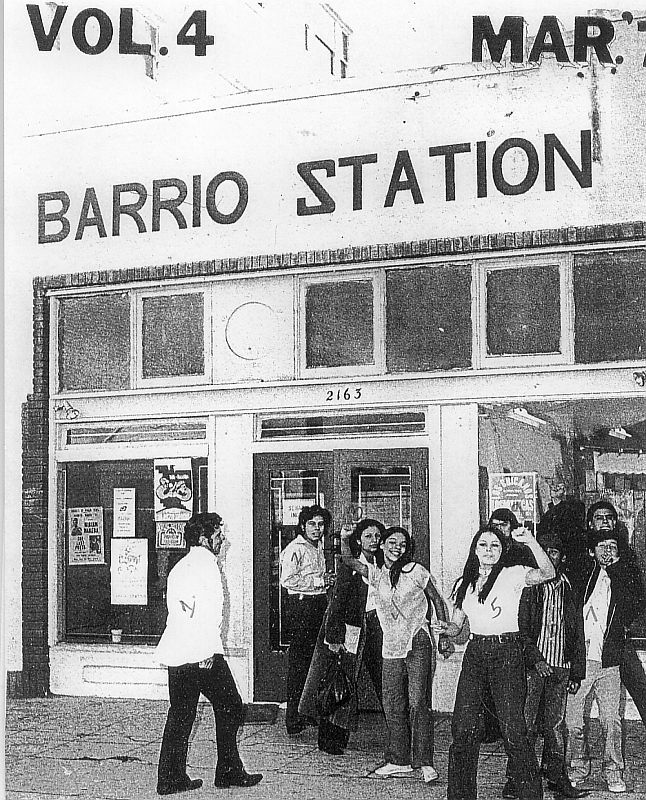 The 1970s were a period of unrest in San Diego’s Barrio. Norma was taking Chicano Studies at San Diego State and meeting with MEChA. Norma adds that Chicano Studies had a lot of theory but they did not always have the opportunity to practice what they had learned. This changed rather quickly as she started picketing the National City Police Station about police brutality and the Safeway stores as part of the grape boycott. This was also a time of student walk outs that began with the “blowouts” in East Los Angeles in 1968. These walk outs were precipitated by inferior and discriminatory education in public schools with a high percentage of Latino children. Student walk outs soon followed in San Diego. While working at the Barrio Station, a parent came in asking for help with some concerns they had about San Ysidro High School. As a result of these concerns volunteers from the Barrio Station were asked to wait outside the schools until the students walked out. The assignment was to keep the kids in order and walk them to the San Ysidro Civic Center. 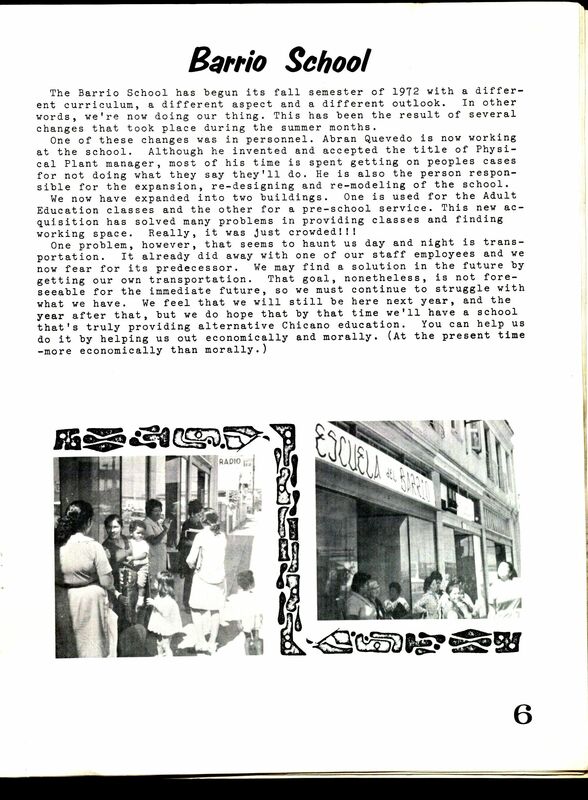 In order to keep those students in a learning environment, Irma Castro, Chicana activist and educator, had developed a curriculum to be used to teach those kids that had walked out. The idea was to hold classes to assure that the students didn’t see it as a party without school work. When the students walked out, the administration locked the gates. Norma remembered seeing some of the students scale up the fence and jump to the other side. At that time Luis Natividad, Director of the Chicano Federation was outside the school observing what was going on when the Superintendent, Mr. Scarbough, made a citizen arrest against Luis. Norma was called to court to testify about the events of that day. Norma was involved in many of the activities that were a part of the activism of the 1970s. The first celebration of Chicano Park day came in 1971. Things were going along rather well with music and food. Police had stationed themselves on the bridge above Chicano Park looking directly down into the park. Towards the end of the celebration a fight broke out in the park and the police moved in. Norma now had the responsibility of walking the kids down National Avenue and away from the melee in the park. This time Arturo Casares, a MECha activist, was arrested. Norma says that in some ways this was the turning point. It was intolerable to see residents treated in the manner that they had just witnessed. Irma Castro had been in Fresno for a period of time. Irma came home with the idea of starting a community school through the Barrio Station. Arturo, Irma and Norma worked together with San Diego Junior College to set up an adult ESL class. At that time Jose Saldivar worked at San Diego Junior college and was able to provide two positions and to certify Irma and Norma to teach ESL. This is how La Escuelita came to be. La Escuelita was part of the Barrio Station and collaborated with the women in the community to help them and their children. A Spanish literacy class was established. Programs were planned around the needs of the families. 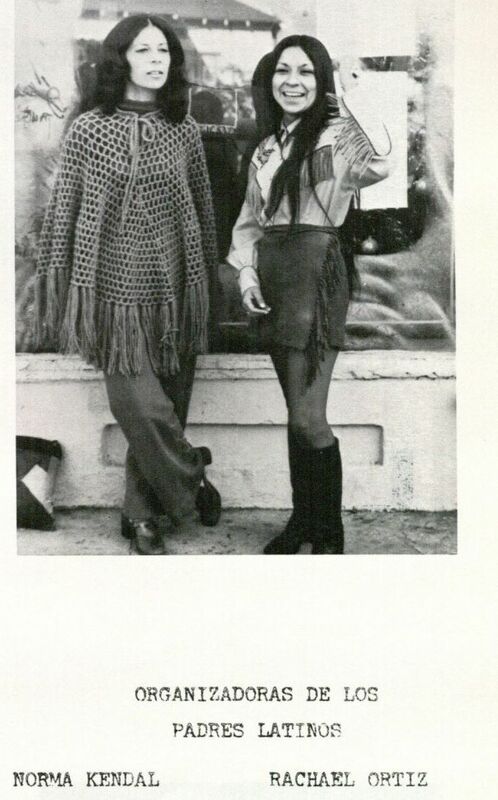 In 1971 Norma and Arturo went to New Mexico to work on obtaining a Master’s degree in Counseling. She returned to the Barrio Station. Norma also applied and was interviewed and accepted for an assignment at Mesa College. After her interview they suggested she “stop by” the Chicano Studies Department. At that time the Chicano Studies department was located in a trailer on the Mesa campus. She spoke to the person who was there and went home. When the call came that she had indeed gotten the job, it hit her that she wanted to stay at the Barrio Station. She explained that she had some very important things pending and she wanted to see them progress. They asked to come and speak to her at the Barrio Station and she agreed. Their comment was “we know we need you more now.” She says her heart was telling her that this was not the right time to move. Norma said she learned some off her most valuable skills at the Barrio Station. Even though Norma was gone from the Barrio Station for 10 months her tenure was between 1970-1975. She considers her major accomplishments were the establishment of a peer counseling program for the youth, organizing and sponsoring Chicano youth clubs, after school tutorial programs and of course Irma Castro and her co-founding La Escuelita. By September of 1975, feeling that the time was right, she accepted employment at Southwestern College. At Southwestern College she had a variety of responsibilities, including academic, career and personal counseling. This support was to prepare students to plan their education career. She also developed bilingual materials for personal development courses. During this period she became MEChA advisor and established a theater group with some of the MEChA members. Norma said they performed every Luis Valdez play there was. She fondly remembers they went on tour and performed in the San Jose area. In San Jose, they spent the night in a large auditorium in sleeping bags. Norma said she looks back at all they experienced fondly. In 1980 Norma became Dean of Counseling and Guidance. In that four-year period she was involved in managing the many aspects of counseling. She developed a special agreement with local high schools that enabled dual enrollment in college courses. There were many accomplishments but conducting a survey on career awareness levels of Latino students, along with the establishment of a Career Center stand out most in her mind. From 1984 to 1987 Norma was Dean of Student Services. In this capacity she developed and implemented a Summer Readiness Program for high risk high school students. She was also involved with the development and implementation of the first transfer center. The center was established to address the needs of potential transfer students. This involved developing relationships with the universities. They also introduced bilingual material that included admission applications. During the period between October of 1987 and January 2003 Norma carried two different titles, Vice President for Student Affairs and Vice president for Academic Affairs. Norma says she is very proud that they never lost focus of the cause— “getting our community educated.” She said it was extra special to work with people who have the same values that you have. She also is grateful for those colleagues that enhanced her learning. She was not aware of some of the needs of Vietnam veterans and says there was a colleague that helped her understand their unique challenges. Norma is proud of the legacy they left behind. The 1980s not only brought professional change to Norma’s life but changes to her personal life. In 1983 Norma married Max Hernandez. She says Max really showed by his actions his commitment to work for our community. I had met Max in 1969 when he was chairmen of the Chicano Federation Board and I was secretary. Max was active in many of the issues affecting the Chicano community. Norma says they had a lot of love and respect between them. She describes Max as very proud, adding that she was very proud of him. Norma said Max became her advisor about many things. She adds “He was always supportive and never challenged me about my career.” Max passed away several years ago. In 2003 the Southwestern School Board held a closed session meeting. When the meeting was over Norma had been named interim president of Southwestern College. Norma saw herself as serving for a short time and then the new president would be selected and she could return to her vice president position. In the past she had been asked to apply for president and had decided against it. This time she decided that she wanted the position. Shortly thereafter she was named president of Southwestern College. She was the first Latina in San Diego County to be named president of a community college. This was not the best time to accept this assignment. California was facing a fiscal crisis and cut backs were taking place everywhere. Norma proved herself by averting layoffs and not having to cut classes. Shorty after becoming President, Southwestern College went through the accreditation process which they were able to pass. Sadly, today there are less Latina college presidents than there were then. While serving as president she became a member of Latina College President group in California They met twice a year and served to mentor and support each other. Norma has received recognition and awards for her efforts to better educational opportunities for all students. In 2006 Norma retired from Southwestern College with every intention of leaving her life at Southwestern behind. In the four years since she had left Southwestern the college had undergone a transition and not for the best. In 2010 she made the decision to run for the Southwestern School Board and won. She continues to serve there. Her role as trustee has been invaluable and has once again put her in the role of fighting for what is right for students and supporting education for all students. Her work has made a significant contribution to the lives of students everywhere.